I had taken Ian fishing previously in the year after some tench and although we did catch some tench it was not quite the size what we were after. He had in the meantime joined Somerfords Fishing Association and we agreed to look around this stretch of river so that he could reduce his learning curve. We met at 6.30am and soon we were on the river looking at some of the swims that contained some good chub and barbel. One of his objectives of the day was to catch a pb chub. Although Ian is an accomplished carp angler he is trying to get away from this type of fishing and enjoy the tranquil life by the river instead. So after we walked the stretch spotting some good chub and barbel. The barbel were difficult to spot because they were lurking under the cabbages for most of the time. However soon we clocked 4 of them to about 8lbs swimming between the cabbages and a couple of reed beds. We soon devised a plan, firstly to fish in a weir pool where chub and barbel are caught practically under the rod tip. The trick here is to bait with hemp and a few pellets behind some reeds and wait for that 3 ft twitch. The rig is one of my chub rigs that’s on the articles and tips part of my site. The swim is only 3 ft deep and often you can see the barbel and chub move in, however today the river was very slightly coloured from the rain we had over the last few days. After baiting with hemp and casting out about 30 minutes had passed. Another 7 minutes passed before the first bite of the day came. The reel was in bait runner mode at first which allowed the fish to take line and after a few minutes a nice chub came to net. This fish was a pb for him so a good start to the day. We said we would give it about 30mins in the swim to see if we could get another, however I think they were spooked so we moved off to fish for the barbel upstream.. If we had stayed there eventually they would have come back and got their heads down again. So we headed off back upstream to where we had seen the barbel. On arrival we soon spotted them in amongst the cabbages. Soon a couple of handfuls of hemp was placed just above the reeds and cabbages hoping that they would drift up and start feeding as they have done in previous years. The flow of the river even after the rain of the weekend hadn’t made much difference. Throwing hemp in by hand is normally a no,no as it ends up anywhere except the correct place. I normally use a bait dropper to get it spot on. The swim where we were stood had been fished often by the look of things and this was confirmed by the barbel being very reluctant to come up to feed on the hemp. We stayed for about 30 minutes and they moved up towards the hemp but wouldn’t go pass the cabbages and reeds. One fish looked about 8lbs and the others not too far short of this weight. There used to be about 15 fish in this swim but in the previous year I caught one which had been raked down both flanks by an otter and had a lucky escape. It’s not good as the otter has been very busy on this stretch and many of the larger barbel have disappeared. In some runs and holes where there used to be 10 or so barbel there are now none as they had nowhere to hid from this predator and all were slaughtered…………there I am going off on one again! So since the barbel were spooky we decided to move about 10 miles downstream to another stretch. Again Ian and I walked the stretch and feed a few swims and saw plenty of barbel and some chub. 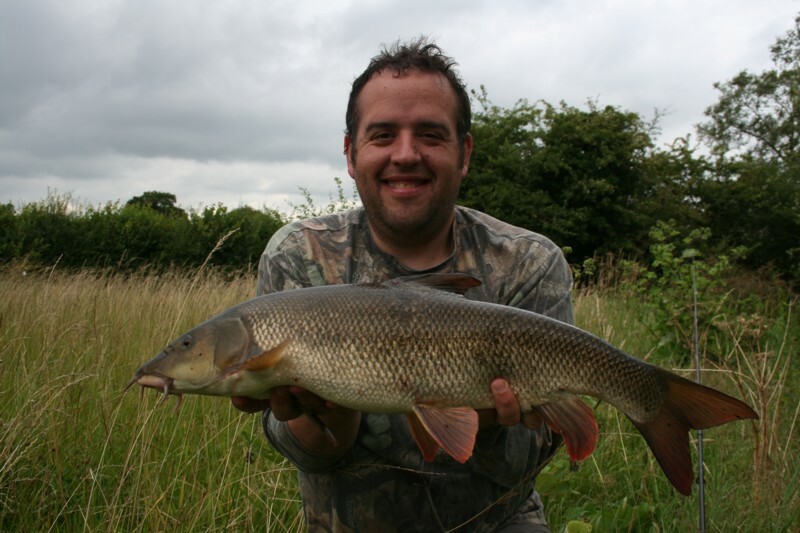 Some of the barbel were doubles together with a good head of others. 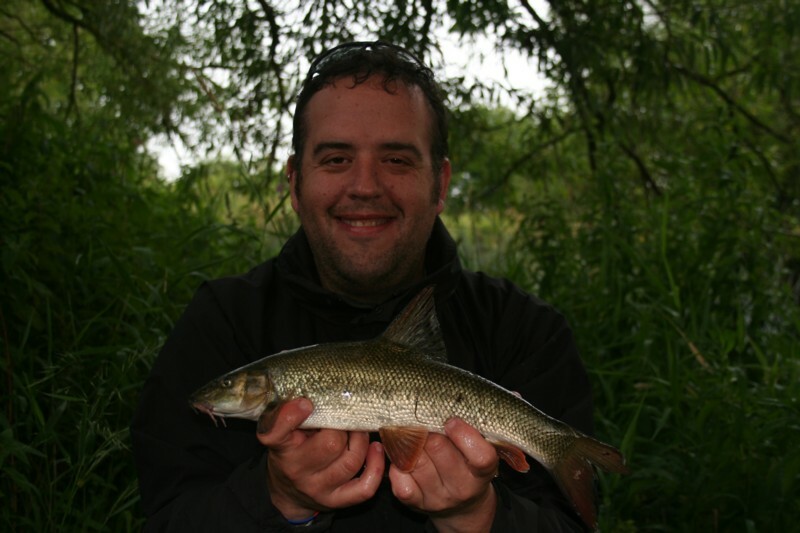 We also saw some good roach of 1.5lbs or so drifting about amongst the chub and barbel. We settled on a swim where I had seen a few barbel last week. In went the hemp just above some cabbages which in-turn was just above some wonderful willow snags mid river. The bottom part of the this short stretch had produced some big barbel to just over 13lbs. I had seen one very large fish there the previous week. So we walked back to the car to collect our tackle. On our return there were about 8 barbel in the swim feeding on the hemp, unfortunately I spooked them when getting close to the swim. The interesting thing was that 4 out of the 8 barbel were perhaps doubles, and the others between 8-9lbs, so a very good shoal with a high average size. While they vacated the swim I put in a few 8mm pellets. It wasn’t long before 4 came back and started to tare the bottom up looking for the hemp and pellets. Ian and I settled in the swim and luckily had some tall vegetation to hide behind. He cast out when they were not feeding as this is very important. Soon they were back in feeding again, drifting in and out. 15 minutes passed when Ian had a right good take from a barbel it tore up and down the swim scything through the cabbages as it did so. The barbel certainly knew where the snags were as it took Ian from cabbage patch to cabbage patch. It even tried to get under some willow roots slightly downstream, however Ian is used to playing good fish and he soon had it under the rod and I slipped the net under a nice barbel. So we took a few photo’s and a bit of video work and slipped her back. The swim was wrecked at the moment so we put in some more hemp and went for a walk. After 30 minutes as I was talking to another angler who had seen a couple of otters on the stretch (feeling miserable now) and I could see Ian had this great big smile on his face. When the angler went on his way Ian said that 4 fish had been feeding again. We settled again but the only response was that one fish came in occasionally to drift through but not feed. So as the afternoon was turning to evening I suggested we try further downstream for a a barbel or chub. 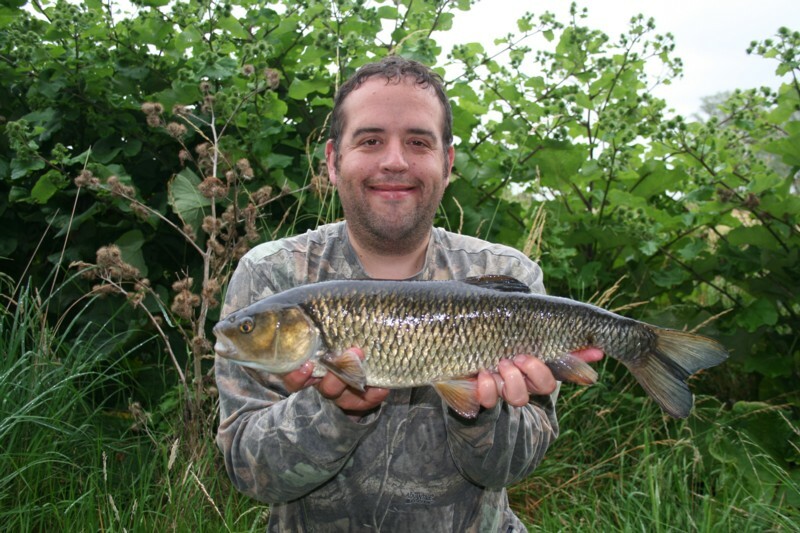 The swim we chose has not got any large barbel but has got one or two better chub. 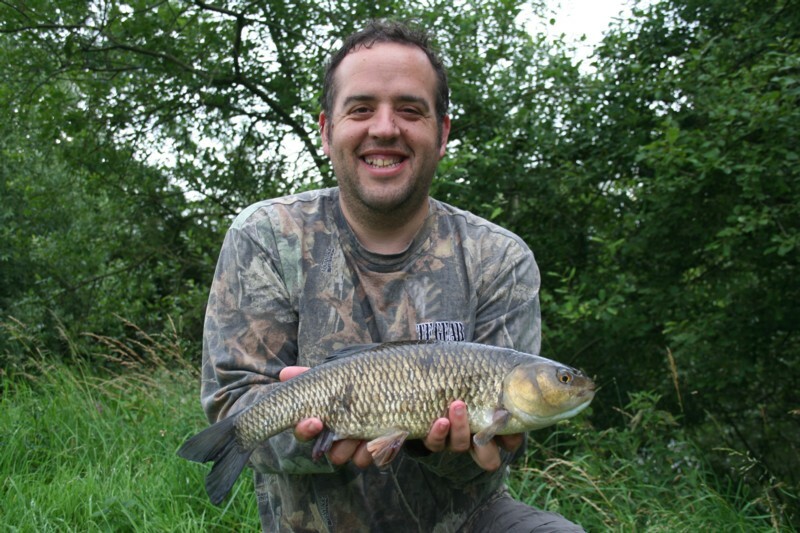 After feeding with some hemp and seeing the chub and barbel feeding on it we cast out. It was impossible to wait until they vacated the swim on this occasion. As the rig went in they all scattered under cover. Slowly they started to come out and feed again, Ian had a few pulls before he struck into the barbel. What a result, a perfect small barbel and there were a few in there which says that there will be a few for the future that for sure. Soon we were casting in again. this time it took about 30 minutes or so before Ian’s rod hooped over. I had been giving him a running commentary of what was happening as I had a better position for seeing into the water. There was a large than average chub feeding occasionally then a few others would join in. It soon became obvious that the one Ian was attached to was in fact the big one. After a bit of a tussle trying to prevent it going into the snags on the far side it was ready for netting. I did have Ian going at the end after it was in the net by saying that I knocked it off…..you should of seen his face! So 4lbs 4oz and a new pb for Ian. He was well pleased with this fish, although it was extremely long and empty once in good condition would go perhaps another 8oz or so. So we decided that was as good place as any to call it a day and head off home. This entry was posted on Wednesday, July 20th, 2011 at 11:25 am	and is filed under Uncategorized. You can follow any responses to this entry through the RSS 2.0 feed. Both comments and pings are currently closed.